So the moment I heard about a large size cockroach resting on the kitchen top which was discovered by my petite tenant, I went straight to the provision shop opposite to grab my hands on these. We dont usually cook. We are clean freaks. We clean all the time and yet they still come uninvited. This time I got the powder in two different brands. The 2 on the left are to tackle ants and cockroaches. 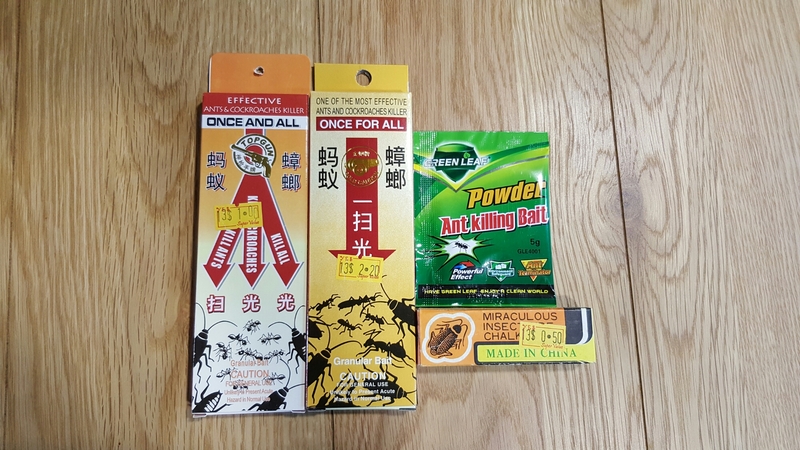 I was kiasu and grabbed another type of ant powder (green) one plus chalk powder ( smallest on right) targeted at cockroaches. The most recent time I used the ones on the left it worked well for the ants. So pleased with it. I sprinkled it on the doorway and window areas. The ants disappeared after few days. Have not seen any dead cockroaches the last time but I’m determined to try all ways. Will update this post if I’m successfully. Meantime you can purchase these for $1.20 $2.20 $0.50 $0.50 respectively from most provision shops.